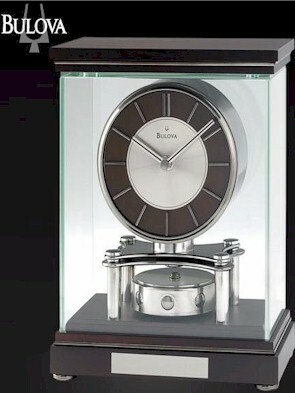 Whether it is to commemorate an important milestone, acknowledge exceptional performance, to provide incentive for continued achievement, or just to show off on your mantel, nothing speaks as personally as a beautiful Bulova clock. Also all Bulova Luggage pricing includes Free domestic shipping and more. No sales tax if shipped to anywhere outside the state of Michigan. On-line ordering is of the highest level secure format. We have been in business for over 50 years and offer 30 day Money Back Guarantee. We also stock and ship out immediately. All Bulova pieces are backed by Manufacturer's Warranty. We also can engrave you clock with your initials at no extra charge, just specify desired initials under "Special Instructions" when placing order.